After unsuccessful attempts in the past I've recently returned to meditation. Looking back, my weekly meditation classes - relaxing with a group of strangers, in a room that I didn't feel totally comfortable in - were not the ideal circumstances in which to slow down my mind. At the time I thought I had to go somewhere to be taught meditation, and I did learn a lot, but I realise now that it can be self-taught and it can be easily practised at home. The problem is that although we know that meditation is beneficial for both our mental and physical health it is not that easy to find the motivation or the time to practise it. Also to the non-practising, meditation can seem only accessible to an elite who possess special techniques, super-strength concentration and spiritual awareness. Wanting to develop the daily habit of meditation I set about trying to understand and demystify meditation and to find easy, enjoyable ways to get started with it again. Here are some of the answers to the questions that I had. Please note I am no meditation guru and these are just my findings. Simply defined meditation means to focus the mind in order to relax your body, calm your thoughts and enable greater self-awareness. You don't have to follow any religious beliefs to practise it although its origins are deeply rooted in various religions and cultures. I found the main thing is to be comfortable (you don't have to sit on the floor) and to find a quiet room without potential distractions. Many advise meditation should be done sitting down with a straight back and with your head up, so as to stay alert, but there is no reason why you can't try it lying down. 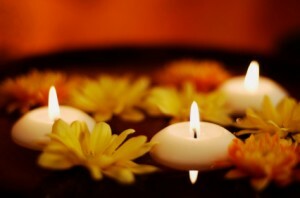 You may find lighting a candle will add to the experience and atmosphere. I try and get as comfortable as I can whilst sitting upright (a sofa is fine) and sit with the palms of my hands open and facing upwards. Try and relax your whole body. Close your eyes and be aware of the natural rhythm of your breathing - there is no need to change it, just let it happen. To stay focused on your breathing you might want to count each breath to a count of 1-10 and then repeat. An easy way to begin meditation is to just meditate for the length of 100 breaths and then stop. As you meditate it is natural for thoughts to pop into your mind like a game of ping-pong so try and acknowledge your thoughts and emotions but view them from a distance without pursuing them. This is the skill you are trying to develop through meditation: the art of letting thoughts pass without you dwelling on them. I find my mind is always busy at the start of a session but can be slowed down gradually. Keep returning your focus to your breath. Relaxation music may help you if you are uncomfortable with silence whilst meditating. Other ways to keep your mind still are to visualise a beautiful natural scene or to repeat a word (mantra) like 'peace' to yourself. When you are starting out it is easier to start with short sessions of about 5 or 10 minutes. You may want to set a timer or simply meditate for as long as you feel comfortable with. I have found that 10 minutes is quite a long time when your body and mind are still. Hopefully, the peace and energy that you will get from even a few minutes of meditating should motivate you to do it again. Feeling restless during meditation is normal and varies from day to day so stick with it. At the moment I am meditating for no longer than 10 minutes at a time as this is a manageable amount of time and I can fit it into my day. How do I find time for meditation? Like any other form of self-improvement meditation requires commitment. I don't practise it every day but each time I do it I feel renewed motivation to stick with it. The key is working out when is a good time/day for you and trying to make it a regular habit. If you find the stillness of meditation doesn't work for you practising mindfulness in your daily life can have similar benefits: focus on your breathing when you feel stressed by counting your breaths or try and clear your mind when you are doing repetitive household tasks like ironing by being aware of your thoughts. Mediation is believed to have many health benefits for both the body and mind. For example it can lower blood pressure, help with irritable bowel syndrome and improve immunity. After I meditate I feel calmer, less anxious, re-energised and more mentally alert. Meditation has been proven to alter our brainwaves with the beneficial effect of promoting relaxation, positive emotions and problem solving abilities in our subconscious mind. The discipline of controlling our thoughts that is practised in meditation can also be useful in everyday life when we need to focus on one thing and avoid distraction. I have discovered that meditation is really quite simple and a useful tool I can use to help me feel physically relaxed and mentally well balanced. I think the key to making meditation work is finding an approach that suits you and not to be put off by the 'rules' or myths that surround it. Need further help with meditation? This entertaining clip from Ted Talks features Andi Puddicombe, a mindfulness expert, who explains how just 10 minutes of meditation a day can help bring focus, calm and clarity to your life. Do you have any experience of meditation or interest in trying it? I totally agree that we don't have to do meditation the way the classes, stereotypes and images tell us to - I think it creates such a big expectation that we all feel we can't live up to it. I too have previously tried the idea of meditation in classes and alone. This year I decided to do it any way that feels right at the time - lying down, sitting up etc. That way, I find the desire just comes to make a conscious "meditation" out of lying on the cool floor, staring at greenery, looking at the sky or sitting quietly on the couch. I find I'm already doing it more and achieving the goal of slowing the mind. Just this morning it was an unusually cool summer day, so I lay out in the sun for 5 minutes and just focused on the feeling of it on my skin. I hope you are well!